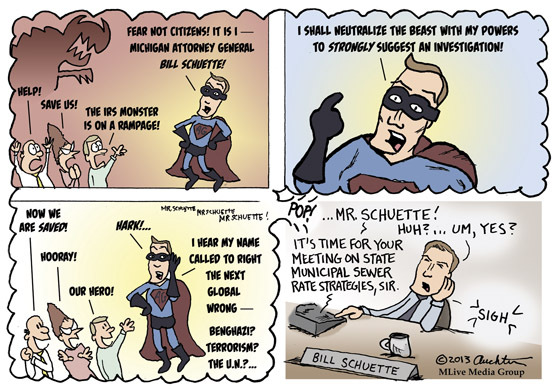 Bill Schuette — SUPER Attorney General! This may appear only to be a swipe at Michigan Attorney General Bill Schuette (and it is a swipe), but there’s more to it. Mr. Schuette’s reflexive partisan politics seems to me to be ill-suited for a position where he supposedly the legal representative for all Michiganders. So when he went wading into national politics on the recent IRS shenanigans, I felt the need to call shenanigans on him. Actually my first thought was to draw him smooching up to a giant poster in his office of former attorney general and eventual governor and national political pundit Jennifer Granholm (“Oh my darling! We know being attorney general is only a stepping stone to better things! ), but it felt kinda creepy, and how many people even remember Jennifer Granholm at this point? 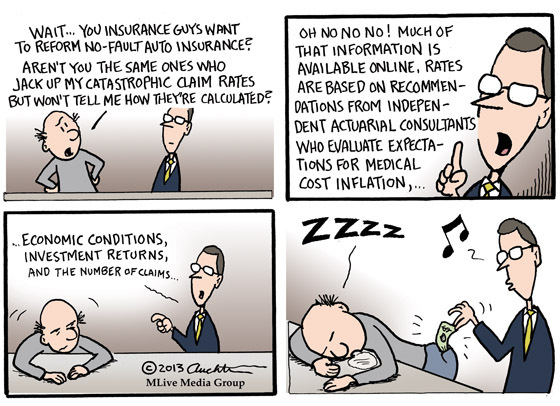 But frankly what I was doing with this weeks cartoon was poking fun at myself. I, too, long at times to sink my teeth into some juicy national topic like the IRS scandal or international topic like Benghazi. But, alas, I am paid to draw about Michigan, and tempting as it is to create some sort of tortured connection between the Arab/Israeli conflict and, say, our wet spring bringing a bumper crop of mosquitos this year (yeah, there is no connection), I should be satisfied with what I have to draw about. So thank you, Bill Schuette! Please keep doing stupid things in Michigan as long as you can until you graduate to a bigger stage! Next week, my daughter Natalina will be graduating from Grandville High School with an excellent public education that has engaged her, challenged her, and prepared her for college and beyond. It has been an extraordinary return on value. The system has served her and her classmates well. A few weeks ago, the Buena Vista school district shut down and ended the school year early for some 400 students. The state and local school board dithered till last week and now have figured a stop-gap way to allow school to complete the year. The system has not served those students well. Of course there are all whole host of social, political, and economic reasons for why all this is. 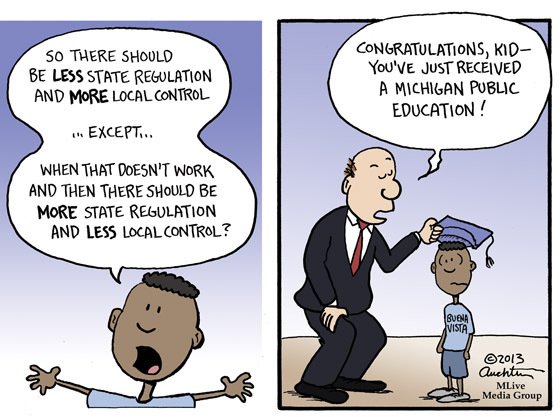 Which is to say, there is no simple solution to “fixing” Michigan’s public education system. But maybe the first step is admitting that it is difficult and going from there. Well I Think Wolves Are Cute…. The Michigan Natural Resources Commission has approved a wolf hunting season this fall for parts of the Upper Peninsula. The regulations approved Thursday establish a target of 43 wolves to be killed. 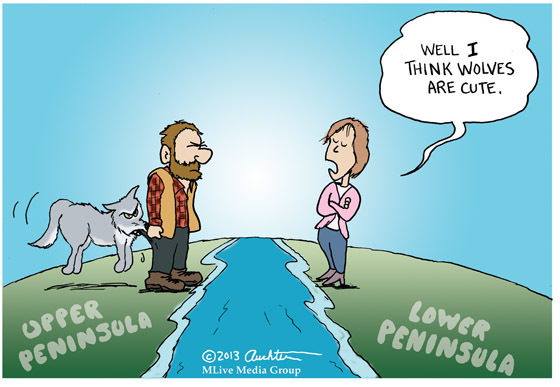 Michigan has an estimated 658 wolves in the Upper Peninsula overall, according to the Department of Natural Resources. So while I believe all Michigan residents have a right to their opinion and I personally don’t know if a wolf hunt is the way to go, determining the best course of action shouldn’t come down to a popularity contest. Not when my greatest predator concern is for the moles that are making my lawn lumpy. I didn’t want to do a cartoon about the bill in the Michigan legislature that proposes to reform Michigan’s automobile insurance laws. Even though it affects me and my family directly, I find it, well, boring. But I decided it was certainly relevant and I should do some research. As I was reading this article, my eyes glazed over when I read the quote from the insurance industry spokesperson. I woke up enough to realize, “This is exactly the problem. These guys depend on knocking me out with their insurance-speak so I don’t realize the money they’re taking out of my back pocket.” It’s kinda like free drinks in a casino. So I lifted the quote word-for-word and used it in Panels 2 and 3.